On Saturday we met up with Tim Gross in Mollala and were soon wandering around in the hills above the creek, trying to find a decent take-out. Unfortunately, all of the roads that led down to the creek were gated, so after spending nearly an hour driving around we finally gave up and headed down to the put-in for the commonly run lower section, which we ended up using as a take-out. Now, for some reason I had it in my mind that there was a class six gorge just above the put-in for the lower run, but I was disappointed when we got there. When we drove up there we found a nice narrow class five rapid that unfortunately had a log wedged in it. I don't know why I thought there was an entire gorge, but I was pretty disappointed that it was only a single drop. Anyway, it is illegal to park anywhere on the scout camp access road, so we left a car on the main road and headed upstream. We got to the put in bridge after about 20 minutes on mostly gravel roads and got ready to go. The first mile or so was mellow, class II stuff with nothing much to get excited about. Soon enough though we rounded the corner and saw a big horizon line. I was in the lead so I quickly eddied out and scrambled downstream with my camera. Unfortunately rocky walls below the waterfall were lined with Devils Club, so I ended up taking a few hits on the way down. The waterfall looked really good from below, dropping about 22 feet into a nice deep pool over a uniform ledge. Once I was set Pete gave me the signal and I watched as Tim probed on the left side without problems, and then Pete dropped the middle while I hiked upstream. Soon enough I was back in my boat and sitting in the eddy above the horizon line. I know it sounds weird, but for the first time in my life I was actually nervous sitting above a waterfall. Before I broke my back running Spirit I was always totally calm before running big drops, but now the stakes are much higher. I don't have the luxury of making a mistake now; one more is all it will take. That said, I pick my battles pretty carefully when it comes to waterfalls these days, which means I portage a heckuva lot more than I used to. Nevertheless, I knew I could run this one clean, but that didn't stop me from getting a little nervous when I was sitting above it.. I lined up and dropped over with no speed, letting my bow drop and penciling almost straight in, which is my new waterfall technique: the controlled pencil-in. It was actually a pretty soft hit, and after a one count I surfaced upright and paddled away- no problem! 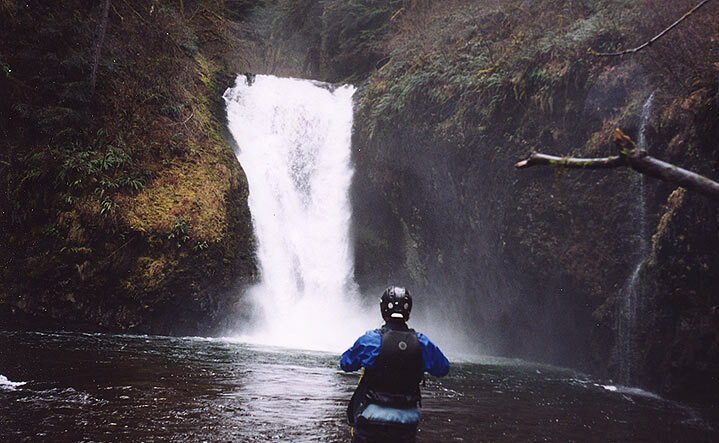 The author drops over upper Butte Creek Falls while Pete watches below. After I ran the falls I paddled behind it, which was pretty interesting; there was plenty of room back there! Once I was back there I decided (just for fun) to paddle out through the falls, and I got a pretty good pounding when I did! It was fun though, and I managed to keep from blowing my skirt and after a few rolls I flushed out into the pool on the other side..
Well, that sure was fun, but we had to take out below this first falls because just downstream is the end of the world. As we hiked up the trail I glimpsed a truly enormous horizon line through the trees. Soon the trail turned to the right and wandered out onto a huge fin of rock just below the second falls, which appeared to drop about 80 feet into a huge punchbowl. The exit of this bowl was blocked by another falls in the twenty foot range, but after a careful scout we decided to skip this one. The lead-in to this lower falls was very tricky; the water all slides over a ledge just upstream and accelerates into a huge rock finger that blocks the middle of the creek, before dropping to the right into a very narrow falls. Running this drop upright will be imperative once it is finally done, because there is a slight ledge at the bottom, just waiting to dismember the out-of-control boater. This drop looks very much like Adrenaline Falls in Colorado, only it is not nearly as clean. The portage around the big falls was not that difficult; we were able to follow the trail most of the way down and then rope the boats down the last part. We were also able to portage 'Adrenaline' falls without much difficulty, though this did require some steep scrambling. 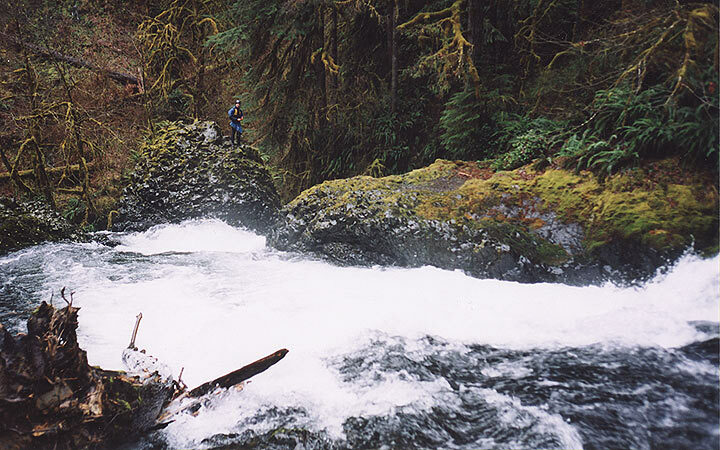 Pete below the 80-footer on Upper Butte Creek. Immediately downstream from here is the last falls. 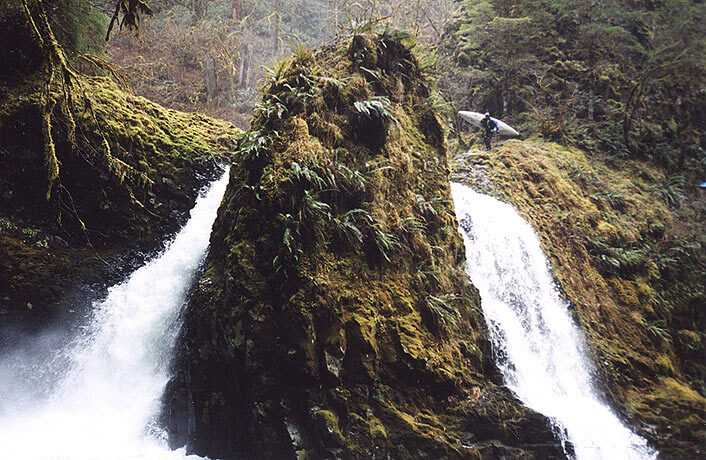 Tim Gross scouts the top of 'Adrenaline Falls'. I think he would have run this drop, but if you look closely you can see that he cut his hand pretty badly climbing out the rock and was bleeding all over the place at this point. Pete getting ready to toss his boat into the pool below 'Adrenalin Falls'. Unfortunately it was not to be a memorable run in the positive sense. After a few miles the creek suddenly became braided and full of wood, and we found ourselves paddling off into the woods, hoping that we were on the 'right' braid. Of course we weren't so after our channel ended abruptly in a loggy mess we got out and carried over to the next channel and continued downstream. This continued more or less the same way for the next two miles or so, which was plenty long enough to kill any kind of high we had from running the upper falls. Soon the creek cleaned up again and we were able to get around most of the wood. I remember at one point I was leading when I noticed that a large sandstone wall had collapsed on the right side of the creek, and suddenly I found myself dropping down a steep, narrow channel towards a horizon line. I managed to catch a tiny surging eddy just above the final drop, which I could see was was clean. Below me the creek dropped about six feet into a narrow hole backed up by a huge boulder on the left, exiting via a narrow slot on the right. I ran the drop no problem, but while I was negotiating the runout I heard a yell from upstream and turned to see Tim wedged end-to-end in the exit slot. His much longer Diablo had gotten a little sideways when he ran the first steep drop, and that's all it took when he got to the exit slot. However, Tim has been in much worse spots and before anyone could get to him he managed to rock his boat while bracing off of the bottom and pop himself free without trouble. Below here the creek dropped through a few more very narrow and technical class IV boulder gardens before finally mellowing out all the way to the take out. None of us ran the class V chute just above the normal put-in for the lower run, but I think we all would have if it had been free of wood. I guess we were all a little bit disappointed with the run below the falls. If it weren't for the mile or two of braided, log-choked water I suppose it would be a good intermediate run. As it is, I don't think it is really worth doing. 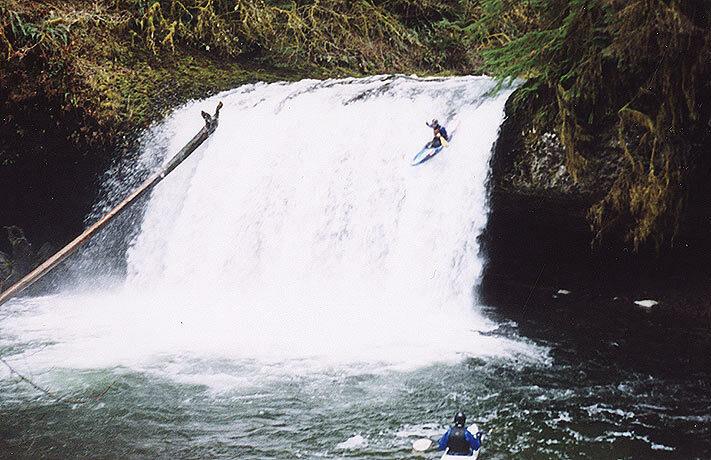 The better plan is for waterfall enthusiasts to drop the upper falls, portage the middle, and then (if you are feeling really psyched) run the lower 'Adrenaline' Falls. You might want to wear a facemask if you do the latter, however. The likelihood of flipping and getting mangled on that one is pretty high, at least at the flow we had. I think at higher flows it would clean up a bit, but who knows..
From the bridge at the town of Scots Mill take Crooked Finger Rd. upstream until the road turns to gravel. About 2 miles from here you should find 400 Rd. It isn't marked very well but look for the number 2 painted on a big stump on the right side of the road. Turn left at the stump and you'll be on the correct road. Stay right at the first junction and continue down the hill until the road levels out. You should see a small parking area on your left that looks like it is under construction. If you see the creek you've gone about a 1/4 mile too far. Park in the parking area and follow the trail down to the river. If you take the trail to the right you will end up at the base of the Upper Falls. The trail to the left goes past the Middle Falls and ends at the overlook of the Middle Falls and the Lower Falls. From here you can follow the remainder of the trail to a short climb down the rock to the pool below the Middle Falls. You can access the pool below the Lower Falls by traversing downstream along the rock face where you will find a steep trail that ends at the river.